Our bubble products are NOT simply bubble wrap packaging. Our products are industrialized manufactured for longevity with integrity to maintain the enclosed air spaces over the life of the product and provide increased strength and puncture resistance. Each independently enclosed bubble layer is sealed with multiple layers of polyester creating highly durable closed air bubbles which prevent the loss of air over time and as a result carry a 5 year warranty. Our double bubble foil products are very effective as metal building insulation, basement insulation, crawlspace insulation, concrete insulation, and other applications where heat and moisture transfer needs to be controlled. For specific install applications and corresponding R-Values, with heat flow directions and enclosed air spaces of specified depths, please view our insulation installation instructions. 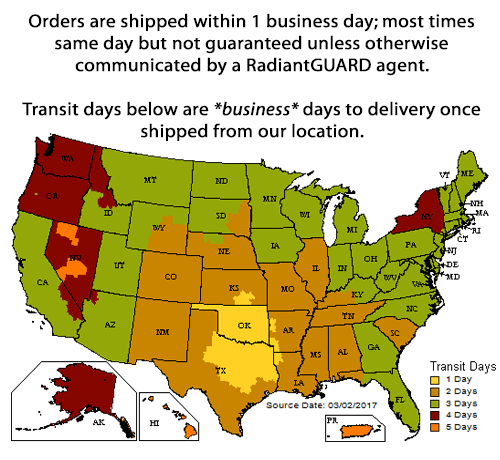 Note regarding R-Values: RadiantGUARD bubble insulations can provide R-Values as high as R-17, however, the R-value is completely dependent on where and how the product is installed. Any bubble insulation that is approximately ¼” thick can ONLY achieve an average r-value of 1 to 1.5 on its own. Any additional R-value is achieved by the use of DEAD air spaces around the reflective product or in used in conjunction with other mass insulation products like fiberglass, foam, etc.